The Riverside Main Library took shape in response to a variety of considerations (stature, view, relationships with the neighborhood). It was up to the architect to provide the conceptual framework within which the structural engineer could then devise the systems, details and calculations that make the building stand. The Romans were master builders and expert at using material extracted from the earth (harvested wood, quarried stone, cooked and cured soils such as tile, brick and concrete) in shapes (arches, vaults, domes, walls and ceilings) to accomplish structures which are to this day impressive. These builders didn’t have at their disposal the mathematics we have had since the 18th century –- trigonometry, calculus, differential and logarithmic equations. All that mastery was achieved over years of trial and error. Mistakes were made, lives injured, many lost. Even after centuries of practice the building enterprise was mostly a slow and dangerous one. Arches, vaults and domes such as the Pantheon in Rome and aqueducts across Europe were among the Romans’ greatest achievements as builders. In the 1,500 or so intervening years between the demise of the Roman empire and the arrival of the 18th century the building of buildings (cathedrals, for example, many of which took generations to complete if they were completed at all) was still a craft, still based on trial and error, mostly intuitive, perpetually unsafe. The strength of character of those who committed their lives, sometimes gave their lives, to build something greater than themselves, sometimes without ever seeing their work completed, is astounding to contemplate. We still tour the world to see and admire what they built. Larger than life matters of the heart, mind and soul, matters of life and death, motivated them to do what they did. It was accountability in the extreme. The dome of the Pantheon is made of concrete and spans 143 FT or 1/3 the length of a football field. Advanced mathematics made figuring out how to build a building on paper possible, so much so that building became increasingly, incrementally less trial and error (the trial and error now happening on paper) and seemingly more rational, certainly safer to build. Science gave us new materials to work with such as steel and glass (then plastic and glue). Math and science made possible the building of the Empire State Building in fourteen months with relatively few mishaps. Math and science gave us the articulated disciplines of engineering that increasingly peeled away tasks and responsibilities (and expertise) from the builder. We got civil engineering, structural engineering, mechanical, electrical and plumbing engineering. We got the architect who mainly draws but also (among other things) establishes the context, manages and coordinates the work of ever multiplying disciplines of engineering and technical specialties. Temporary wood scaffolding called “centering” was built to support the individual blocks of an arch before the keystone was set in place to hold it all together. No matter how practiced the builders they must have always been a little apprehensive about removing the centering. With science manufactured materials and specialized trades (suppliers who deliver or install only certain parts of a building) proliferated and there arose the imperative that someone manage them, the general contractor. Few buildings are built today without first an architect (and his or her team of engineers and technical consultants) drawing them completely. Then someone else who is not the architect, the general contractor, manages the array of specialty builders who build them. It took six centuries to build the cathedral of Milan, 14 months to build the Empire State Building. About a hundred years ago a well-intentioned law was established here in California and nearly everywhere in America which required that any public entity (city, state, school district) attach the architect’s drawings as exhibits to a contract for which general contractors in a competitive process must submit a price (or “bid”) to win that contract and the obligation to fulfill it at the price promised. Whoever submits the lowest price wins. (This was supposed to have been the remedy for cronyism and corruption). The set of drawings that describes this project for a school in Los Angeles is over 1, 000 (30” x 42”) pages which when stacked stand nearly 8 inches tall. This is a 3 ½ year construction project that had to be completely documented before start of construction. The law engenders all sorts of behaviors that are contrary to the public’s interest. The way governments hire general contractors puts pressure on them to reduce their prices to win the job to only then be forced to find opportunities to make it up later. This in turn puts pressure on the architect to make sure everything in the building is accounted for in their drawings which are turned into the content of a legal agreement. If it’s not in the drawings it doesn’t get built or if it gets built it gets charged to the government (or agency or school district) as an “extra cost”—all of which elected leaders— the stewards of the commonwealth --- cannot stand. In addition to graphic descriptions of a building, the drawings, there are narrative and numerical descriptions called “specifications” that describe all of the systems, performance criteria and details of the building. 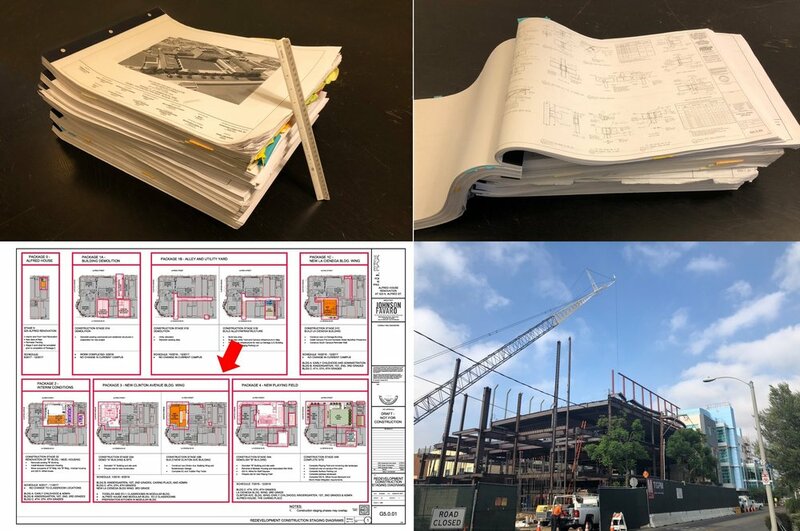 The specifications for the Costa Mesa Library project comprise nearly 2,100 pages. The table of contents alone is eight pages long. This transforms the most important tool in the architect’s arsenal of creativity and invention-- the drawing, the very thing that had emancipated builders from the tyranny of building by trial and error—into a tool of defense against the claims of a general contractor and the ire of government leaders. We play a game of cat and mouse in which the architect grows the drawings in detail and volume while the general contractor seeks ever more sophisticated ways to find loopholes in the drawings. Despite the sophistication of digital modeling, every three-dimensional configuration must be described in two dimensions with descriptive diagrams and numbers. We who draw and build buildings who used to be on the same team who use to be the same people now think as much like lawyers as we do artists. We engage in pointless little civil wars always about time and money. We forget that we are in this together, after a good outcome, in it for the long game long after all the spats will have receded from memory. We are not enemies we are friends. As friends we—governments, architects and builders ---should as we know we can appeal to the better angels of our nature and find a better way to serve those for whom we build. Drawings are the only way to assure that the building will get built as designed. The more the better.